Comprised of Australian-raised brothers Isaac (vocals, keys) and Thorald Koren (vocals, guitar, keys), and the US born Shakerleg (drums, percussion), The Kin have enraptured live audiences worldwide with their powerful vocal harmonies, hard-driving guitar and Hand Drumming, and captivating stage presence. They are masters of the gritty, propulsive alt-pop sound that comes across best during their live performances. The band spent two years on the road in the U.S., Australia and New Zealand, touring with Coldplay and forty arena dates worldwide with P!NK where their last EP, ‘Get On It’ (Interscope), went to the top of the charts and the band were awarded a Gold record. Known for their brotherly harmonies, their secret weapon is Shakerleg, who smashes the drums with his bare hands. 'Shakes' hails from the NYC Subway and gives every last piece of himself with each song. 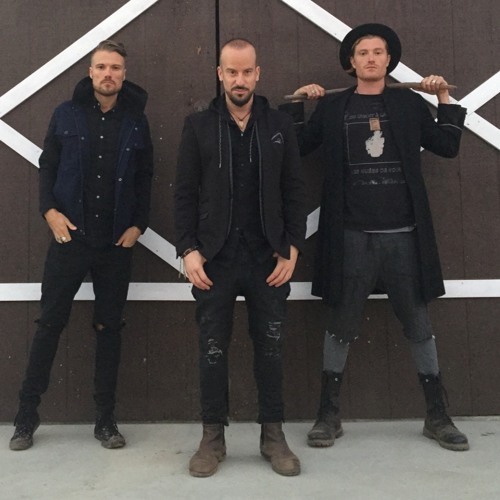 The Kin also are known for causing trouble with their signature “Musical Robberies” where they burst into a randomly chosen high-traffic public area, such as a diner or airport, and surprise innocent onlookers with a spontaneous live performance. "We like to hit our audiences on all senses", says Thorald. The Kin have launched several of these “musical robberies,” including at the Sundance Film Festival, SXSW, Soho House, Seven Grand Whiskey Bar in Los Angeles, and a French airport. The band brings the same unique brand of creativity and high-energy to the studio and songwriting for this album, working with LA producer Jon Castelli (Macklemore, Yelle) and Irish pop songwriter, Jimbo Barry (The Script), and Scott Jacoby . Expect larger than life drums, soaring vocal hooks and thick harmonies only brothers can create. The band operates under the assumption that every time they step up to the microphone, it might be the last — and they play accordingly, no holds barred.